L. J. 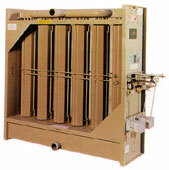 Wing VIFB vertical tube integral face and bypass coils preheat outside air for air make-up systems. Because the VIFB coil operates with full steam pressure or constant water flow at all times, it prevents breakdowns in the central system caused by freezeup. The temperature of the discharge air is controlled by proportioning the entering air through the multiple heating and by-pass channels. The air is proportioned by the unique clamshell-shaped dampers which maintain a constant pressure drop, thus allowing a constant volume of air to pass through the unit. Performance can be calculated by using the L.J. Wing specifier program. For more information, request bulletin VIFB.